The Hub were asked by the Royal Air Force Museum to expedite works at Cosford to meet the RAF Centenary date of 1 April 2018. This small exhibition utilises components from ‘RAF Stories: The First 100 Years 1918–2018’– recently installed at the Museum’s London site and opening on 30 June – designed by MET STUDIO and provides an introduction to the RAF’s 100-year story and relevant collections. The development saw a major intervention into what is essentially a large atrium into the first hangar at Cosford that would give visitors a better understanding of the people behind the RAF. Since 2003 the space had been occupied by a timeline that talked about the history of flight from 1903-2003. 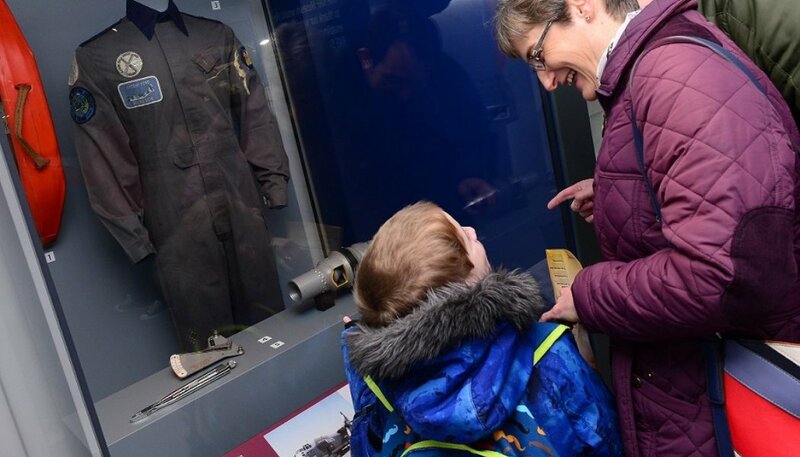 Now the new display at Cosford has five large showcases, which present objects that have never been on show before with video projections and full-size silhouettes that tell personal stories. It is hoped that the site will attract 398,000 visitors from April 2018 to March 2019, an upturn of 10 per cent. For the entire project the RAF team held discussions about what they were expecting and used the Cosford display to set design and build principles that are being applied in London. To maintain consistency between the RAF Museums in London and Cosford, The Hub utilised the same team on both sites to deliver a mirrored exhibition. “Our focus throughout the delivery of RAF Museum Cosford was maintaining MET STUDIO’s original design intent and then adapting the designs to maximise the potential of the space available at RAF Museum Cosford to open in time for the Centenary celebration on Easter Weekend,” says Joe Clarke, Project Manager at The Hub. To meet the opening deadline, programming was crucial, says Joe, and this was achieved by scheduling the enabling works and informing all specialist subcontractors and the Royal Air Force Museum of critical dates. The Hub also conducted a comprehensive site survey early on in the programme, which allowed their design technicians to identify changes required in the design and also highlighted changes that need to be made, such as the need to reduce set work heights and review showcase access. The project has not come without its challenges and prior to the fit-out, The Hub conducted a full strip out, with enabling works uncovering original structural columns. Another key challenge identified during the works was the fact that the hanger continued to be a primary route for visitors circulating through the site, especially in adverse weather conditions, which meant it had to be continually assessed to ensure the health and safety of visitors. To make this work, The Hub securely partitioned construction and build areas and developed clear walkways to allow site works to continue during visitor hours with external works conducted in liaison with the Museum outside of opening hours. 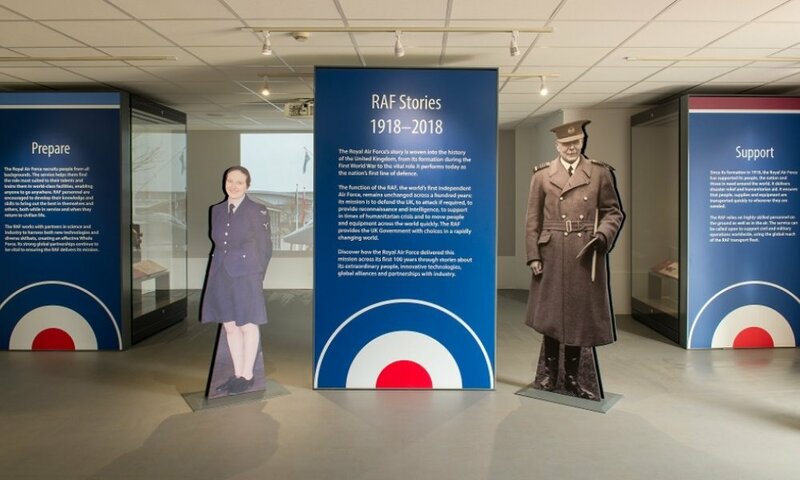 The display is part of a new Interpretation Strategy by the RAF Museum, which explores the roles of the RAF through its people as well as its unique collections. The Cosford display features are four showcases with graphics that each depicts an area of expertise associated with the RAF: Attack, Prepare, Support and Defend There is then one large showcase, which has lots of quirky, small objects such as Christmas cards produced from the metal of aeroplanes by RAF soldiers at the front, a dog leash, uniforms, allowance books for tobacco and sugar as well as dinner invitations. A feasibility study is now underway at Cosford to determine future improvements and the two Museums will be complementing each other in terms of how they tell the RAF’s story globally. 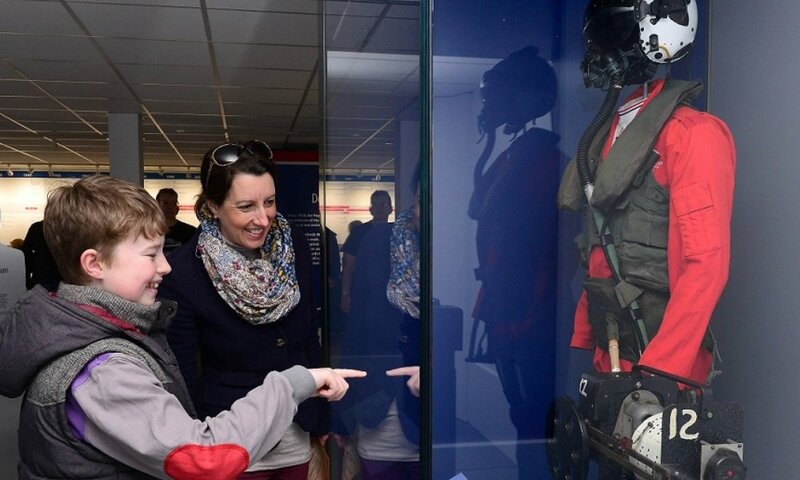 The Cosford project was completed in time for the 1 April Centenary, enabling visitors to commemorate the past, celebrate the present and imagine the future of the RAF. Prepare: The RAF’s Red Arrows display team represent the pinnacle of the services training and ethos. A Red Arrows pilots’ flying suit and distinctively marked helmet feature as part of the display. Attack: A selection of objects illustrating the RAF’s attack role ranging from an early aerial reconnaissance camera to an arming key for a nuclear bomb are now on show. Defend: The Battle of Britain in 1940, which tested the RAF’s defensive abilities to the limit, is represented in the display including rare and unique artefacts. Support: Featured in the display will be the story of a ground crewman Antony Ford who served on the Operation Bushel famine relief effort in Ethiopia in 1984-85, as well as a helicopter winch operator’s rescue strop and an air-to-air refuelling.